"First to declare slaves ""contraband"" of war, Butler caused great controversy when he issued his famous ""Woman's Order"" in New Orleans." Ben Butler really didn't care that he was a bad general; he was a good politician, and knew that he had to be a general to have the sort of post-war career he wanted. Born just into New Hampshire, he went to Exeter Academy, then Waterville College (now Colby College) in Maine. After graduating in 1838 he studied law and started practicing in 1840. He rapidly proved a successful criminal attorney, and moved into politics. In 1853 he was in the Massachusetts legislature, and in 1859 the state Senate. 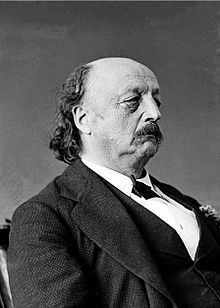 He was also a minor figure in national politics: he attended both Democratic National Conventions in 1860, at Charleston he backed Jefferson Davis for President, and in Baltimore he supported John Breckinridge. Before the war he was for peace, but he switched to a War Democrat. Three days after Fort Sumter surrendered he was a Brigadier General of Massachusetts Volunteers. He was put in charge of Annapolis, a responsible job since eastern Maryland was pro-slavery. He achieved a variety of political coups: he moved troops around strongly pro-Southern Baltimore by sea, reinforcing Washington when it was weak; he then snuck troops into Baltimore and brought it under control. This earned him promotion to Major General of Volunteers within a month. His new job was commanding Fort Monroe and district. A subordinate was defeated at the small battle of Big Bethel, but there was no chance of losing Fort Monroe. Instead, slaves were escaping from their masters to the protection of the Union troops. Butler made a vital decision: he refused to enforce the Fugitive Slave Act, instead declaring runaways contraband of war"